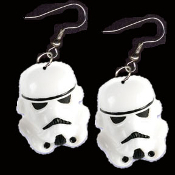 HUGE Funky 3-d Imperial STORM TROOPER EARRINGS - Classic Star Wars Trilogy Sci-Fi Punk Villain - Lord Darth Vader's Stormtrooper Soldier Novelty Charm Costume Jewelry - Come to the Dark Side. MAY THE FORCE BE WITH YOU! White dimensional plastic charm, approx. 1.5-inch (3.75cm) Tall x 1.25-inch (3.13cm) wide. Great for Halloween party or cosplay costume!